The last year of my life has been spent in a constant state of expectation and unknowing. 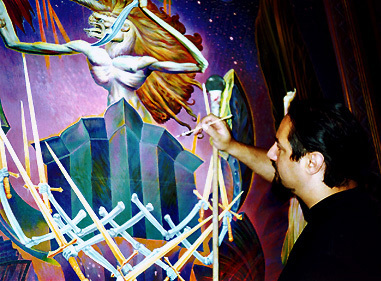 Working together with Ernst Fuchs was an exhilarating, if not exhausting experience. The man himself, at seventy-one years of age, remains a whirlwind of activity, commanding amazing reserves of energy. We worked together intensely - twelve hours per day, twelve to fourteen days straight. Typically, my wife and I would arrive at Castel Caramel in the morning, and have breakfast together with Fuchs while some rough plan for our activities was worked out. Or, we'd get a call from him early in the morning, telling us to meet him at the studio in Monaco. Either way, the day would be spent in constant interaction with whatever idea or inspiration appeared to him that moment. While my wife busied herself with his secretarial, financial, or legal affairs, I would paint on one or another of his large canvases. One day I might paint designs on his elegantly executed frames; another day underpaint large areas in white casein; yet another day work on a detailed image. The variety of tasks was endless. On the best of days, he'd entrust me with achieving some interesting effects in light, volume, and colour. And it was particularly during those moments that I became aware of 'learning to see' - as I came to think of it. I was certainly learning many things about the technique of painting, particularly his unique practice of the Mischtechnik. But, more than that, I was also acquiring his vision - his way of looking, understanding, and interacting with a painting. What I would like to recount here is not so much the learning of a technique, but the experience I had over the past year - of learning to see. Although I was a paid assistant, I also saw myself in the more traditional role of apprentice, learning the secrets of my trade from a recognized master. I had first come across Fuchs' works in 1990 when I spent a year studying at the Akademie in Vienna. And, for many years after that, I continued to find renewed inspiration in his paintings, but also in his writings and ideas. Then, I began to have a series of unusual dreams. With each dream, I came one step closer to meeting and then actually working under Fuchs. 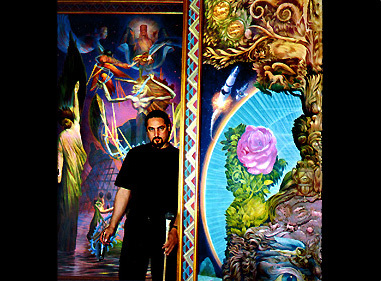 I interpreted these dreams otherwise at the time, as symbolic of my own developement as an artist. But I can see now that they predicted - in an uncanny way - my eventual meeting with Fuchs. After these dreams, it was a series of timely encounters that eventually led me to my master - thanks in no small part to Andrew Gonzalez and Amanda Sage. It is strange in our modern age to refer to someone as 'my master'. It denotes a degree of servitude extremely disagreeable to our democratic ways. And yet, make no mistake, he was the master and I (together with my wife) was not only apprentice but, at times, servant and slave. "If you want to be liberated from the constraints of tradition and authority," he said to me one evening over dinner, "then you can be like those art students who go to art school and do what they want for four years, and leave having learned nothing. Or, you can submit yourself to a greater tradition of learning - and do what you're told!" And he went on to describe how tradition is only passed on when one learns from his master, who has himself learned from his master, and so on - a chain going back in time, unbroken. Those students who cannot hear the accumulated teachings of the masters are too stupid or too proud, and will never become masters themselves one day. Indeed, I was not the ideal apprentice or assistant. My own artistic tendencies, my intellectual pride, and my fiery Mediterranean temperment asserted themselves again and again, and I only held them back through the greatest of efforts. But, through it all, there was the gradual attainment of something which came only in bits and pieces, and at the most unpredictable times. This was the acquisition of vision. I spent countless hours in Fuchs' studio, standing on ladders, crouched under them, or even falling off them - while painting, painting, painting. But, one of my more pleasureable tasks was assisting him while he painted. This meant handing him colours or brushes, but also intuiting what he needed ("Hand me a cold blue," he'd say, leaving me to select among fifteen different blues on the table. "Lay out ten or so colours on the palette that I can work from," he said at the beginning a sitting with a German prince.) Most importantly, this allowed me to watch and learn how he paints. In all, I spent hundreds of pleasureable hours watching how a master achieves a variety of different effects. While painting, he would even sometimes 'teach me' by offering short, encapsulated comments: "Always put dark before light, and light before dark", "A colour is made stronger by the surrounding colour that complements it", or "You see? - Make bridges from one colour to the next" Many of these suggestions can be found in Max Doerner's Materials of the Artist , chapter six, part two. Knowing them is one thing. Seeing how they actually accomplish their desired effect, at that moment then and there, is something altogether quite different. It was during these hours that I gradually came to see a painting (to a certain degree), the way he sees it. I could see what colour he would choose next, where to apply it, and so on. Suddenly, he added a certain mix to the colours and - the whole composition came alive. The image that stood before me appeared extremely three-dimensional. I'd had this experience before, while looking at my paintings under the influence of hashish. But now, this feeling of depth, this sense of looking through a doorway into another world, was happening naturally - and totally unexpectedly. As I discovered, the marathon painting sessions also had their deeper purpose. True, after many days of painting for eight hours or more, I developed tremendous eye strain - headaches, trouble focussing, etc. But I also developed a new way of seeing the image under my brush. After six or seven hours of concentrated painting. my 'depth vision' would inevitably come to me. So that, by the end of the day, I could turn to whatever large canvas was there in the studio - and look into it, as if, into another world. Fuchs said nothing about my standing there and staring at one of his works, even though I was supposed to be painting somewhere else. On the other hand, he started to entrust me with tasks that, in a sense, required this way of seeing. One of the demands of the Mischtechnik is to render the object soley in terms of light and dark (using white casein), and in the absense of any colour (which would then be glazed later on). So, the aim at the casein stage is to render the object with as much volume as possible. I cannot remember how many times Fuchs would thunder aloud "More volume!" when pointing to a recently rendered figure. And the stunned assistant (not me, luckily...) would wonder how to make it any more voluminous than that. Meanwhile, by seeing the painting three-dimensionally, I could see how the figure really did lack volume. And, what is more, the way towards rendering 'the illusion of the third dimension' became eminently clear. Indeed, I would ask myself how I ever even tried to paint such a thing in the absense of 'depth vision'. The perspective, the fore-shortening, and especially the necessary volume presented themselves to my way of seeing as natural and obvious. An anecdote comes to mind to illustrate this effect. While in Klagenfurt working on the Apocalypse Chapel, Ernst Fuchs, Andrew Gonzalez and myself often amused ourselves over breakfast by playing a visionary game together. The morning paper would offer a little cartoon, with two seemingly identical pictures. But the one on the right had five minor differences from the one on the left. Of course, the person who could spot all five first was the winner. Sitting between them, I discovered a little trick. If I crossed my eyes and re-focussed them, so that the two pictures now became three, then the one in the middle would vibrate in the places where there was a slight variance. In a matter of seconds, I could identify all five differences. Seeing the volume of the object with 'depth vision' has a similar such effect - immediate and precise. The most obvious errors show up. Indeed, they glare at you, and are extremely distracting to the overall effect which the artist is seeking to produce. This 'seeing into the depths' was only the beginning of a process, though I had no idea where it would lead or, indeed, when that strange new step would occur. The next step came a few weeks later. My vision of the painting process began to change when I noticed that Fuchs never applied a colour in one place only, but had a tendency to add a little of it here, and then there, and then way over there - leaving traces of it all over the painting. Each time he stopped painting, at the end of the day, his work had achieved the same 'overall balance of colour' which had existed at the end of yesterday's work, and which he had disturbed this morning to advance it. Then, while Fuchs was adding the finishing touches to his largeTriumph of the Unicorn picture, the next revelation came. He entrusted me with some pretty interesting tasks on this picture - developing more depth in the sky; outlining the figures so as to place them more 'in' the setting. At the end of that day, as we stood looking at the results together, I asked, "Doesn't the shield need more highlights?" And he replied, "No. You must separate painting from drawing. There is already a strong separation between the colours in the shield and those behind it." And then came the enigmatic pronouncement: "Colour IS space," he said. I had no idea what he meant. The next day, I stood by and observed while Fuchs was busy working on the Ixion figure at the bottom of the painting. Normally I am extremely sensitive to line - how one line relates to another, creating flow and movement within the composition as a whole. But Fuchs was always telling me, meanwhile, that I have a very good intuition for colour, only I must develop it further. Suddenly, I could see the entire composition of the Unicorn painting, not in terms of its line, but its colour. The overall balance of colour. It's spectral re-arrangement in two-dimensional space. The harmonies produced by laying colours both on top of and beside each other. The effect was not unlike symphonic music - the way the disparate parts harmoniusly combine so as to create a whole. Not a static whole, but one that is in a continuous state of transformation. My feelings could ride upon these arrangements of colour the same way they could ride upon the melodic development of a theme in classical music. I now understood why he refered to his smaller paintings as 'songs' and his larger ones as 'symphonies'. All the colours in the painting were in a continual state of harmony and movement, resulting in a 'balanced tension'. This experience sent me back to my reading of Plotinus, and his treatise 'On Beauty' in The Enneads. Plotinus was a Greek philosopher of the third century, a contemplative with an extremely mystical bent. He described how, as a result of contemplation, we could knowingly return in our thoughts to the place from whence we came - to the Divine Source, that is, which he called 'the One', recognizing it as a Divine Unity. Fuchs and I often turned to the Ancient Greeks in our discussions, as we shared an uncommon interest in Plotinus, the Pre-Socratic philosophers (he could quote Parmenides by heart) as well as the Gnostics. 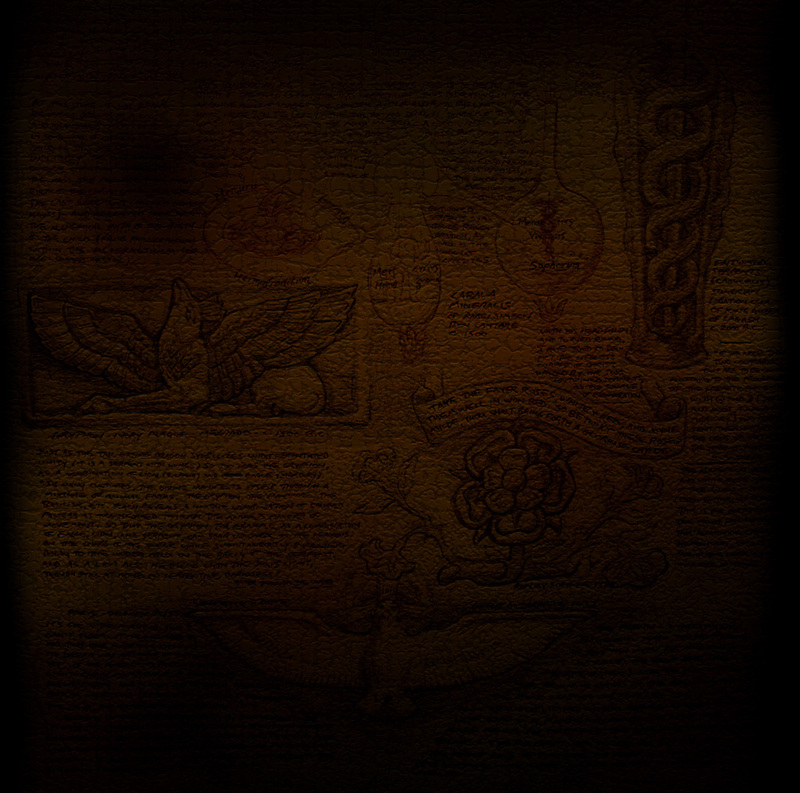 The worldview which they formulated was something we shared, though we only spoke of it in a fairly oblique way. Neither of us wanted to say to the other - outright - that 'All is one!' or 'the world is a prison!' Such a view onto the world is a matter of personal experience - to be felt or 'known' but impossible to justify, explain, or somehow convey to others. And yet, I find in my journals that Fuchs did say to me, during dinner one night in Brasserie Quai des Artistes, that he strongly agreed with Gnosticism. Over the course of our discussion, he described Gnosticism as "a remembering of our origins in the Divine." And he went on to say that the Divine is "a single light at the centre of a circle of the many." No doubt he had a deep intimation of this. Indeed, he had certainly experienced and known it. I'd also had experiences of this sort. 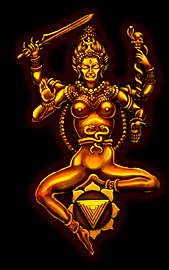 What I hadn't done, until that time in my life, was to see or experience the Divine Unity in a purely aesthetic way. 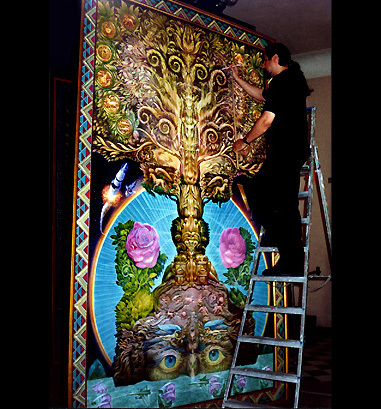 Contemplating sacred symbols, 'entering through' them to their origins in the Divine - this I had done a number of times. But I had never really 'seen' the hidden presence of that higher Unity on the surface of the canvas, in its play of form and colour. This explains, as much as any text can, the experience I had while looking upon the Unicorn picture. 'At a stroke', I came to see the unity manifest in diversity: how the forms, the lines, the colours - all - acquired a certain harmony and, transcending that, a total relationship to each other as a unified whole. Beauty comes from harmony, and harmony from unity. And so, while gazing at a work of art, the beauty and harmony of the work suddenly remind us of our origins in 'the One'. As my year-long apprenticeship drew to a close, I began to question him more intensely on the subject of painting. 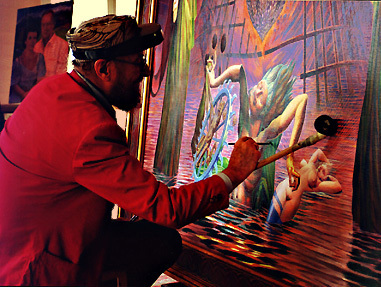 Particulary, I wanted to know what goes through his mind while he paints. "It is within, say, the purple and the green that a certain colour arrives that you can't mix on the palette. And you follow that colour, and you say, well, complementary to that shadow, the light must turn a little more orange. You know? There's always a kind of, 'visional' process that leads you, if you follow it with knowledge and feeling, to a perfect image." Back in Paris, I began to realize some of the deeper implications of what he'd said. I had spent hours and hours concentrating on the surface of his pictures - all, to what end? It was not the resultant image that mattered so much. It was the process. The 'visional process' as he said, 'that leads you, if you follow it with knowledge and feeling, to a perfect image'. The act itself of painting. This was the final key to 'the acquisition of vision'. That is why he spent so many hours in a day, indeed, so many hours in his life, sitting before an easel and painting. It was not the painting itself that mattered, but losing himself in the act of creating it. So many times, my wife and I tried to tear him away from his easel because he was late for a portrait commission. Or, we had to distract him from painting because of some pressing business or family matter. But, in truth, we rarely succeeded. He was far off, in another world, seeing the painting, reacting to it, adding where necessary so as to create the overall harmony. And, it is interesting to note, he still had an accurate memory of every painting, every detail, and when or where he had painted it. When looking at one of his older pictures, he rarely commented on its intended meaning or the personal meaning it had for him. 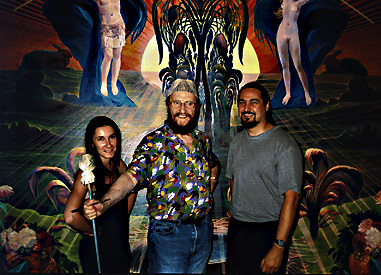 My wife Florence, Ernst Fuchs, and myself. Instead, he would look at it and say - remembering the act of rendering it - that it was created at such and such a time and place in his life. The act of rendering involves putting myself into a state where I am strongly aware of harmony, of balance, of the unity and totality. Think of the complex relations of 'line' in a composition: the way one line is established in the awareness of its relation to all the other lines and the composition as a whole. What does it mean, to choose a certain colour? I do not just choose any colour. Instead, I feel, observe, consider, and realize that it must be 'this blue'. Hundreds of memories of blue are related to each other through my selection of this particular blue: the blue I saw through the waves while on a boat off the coast of Malta; the cold blue of freezing ice in Canada; a cold glowing night; of depths seen only in my dreams, of infinite depths. A colour is only selected by coalescing a thousand observations into one hue. At the moment of painting, I am intensely looking at the painting. As I render it, I am constantly putting myself into a state of 'concretizing vision'. For example, establishing a form, I am constantly feeling the tension of light and darkness, and seeking an exact balance between the two. So that, combined, they accurately render the play of light and shadow on a particular surface. Each moment I paint, I am in a state of vision. A state comparable to the stilled but eternal vision of the Gods. Seeing the parts as a whole. Freezing a moment in time. Seeing the movement in the work as a moment frozen in time: the 'stilled energy'. Each painting manifests all that I have seen and learned about art, up to this point in my life. Once the painting is finished, I can still clearly remember the struggle I had to achieve each of its details. Each of the moments I have spent rendering the different parts of a painting return to me very clearly in my memory. Meanwhile, the act of painting itself creates more and more such memories. But, when the act of painting is considered sub specie aeterni (from the aspect of eternity), it manifests something more. It manifests to me how so many disparate moments of my life may be felt in unity - brought together and then made one. Painting, I now realize, is not an end. It's a process. What comes out at the end doesn't really matter all that much - in the eternal understanding of time. Each time I paint, I do so as a ritual - a ritual that repeatedly returns me, while painting, to an awareness of the One. So, each time I paint, I am there, in eternity. It is the process, the time dedicated, the continual return to eternity transpiring now. The paintings I leave behind have some value perhaps to someone else, as a way to experience the things I have seen. But, by rendering it, I have already passed through the doorway it has opened. at Torri Superiore, Italy (just over the hill from Fuchs' studio in Castel Caramel).